Dhoni doesn't appear much for the interviews and avoids coming on the camera even for the funny segment. Team India sealed the series by 4-1 against New Zealand with a great win in Wellington as they defended 252 runs comfortably. All the players in the team share great camaraderie with each other and to show the same, the BCCI has started a new segment named Chahal TV on which Yuzvendra Chahal interviews the best Indian player of the match mostly. After a series victory, the leggie tried to get hold of MS Dhoni for the same but the veteran ran away. The funny tradition of ‘Chahal TV’ has begun since the ODI series against Australia which preceded the New Zealand tour. The likes of Virat Kohli, Mohammed Shami and Rohit Sharma among many have already featured in this hilarious segment. All the cricketers, at the end of the video, also promote the program and suggest everyone to make a special contribution to the team’s cause. The post-match presentation ceremony followed some fun on the ground as the Team India players posed with the trophy. 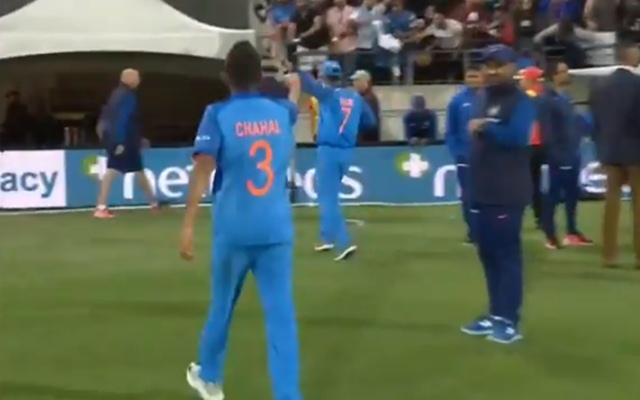 However, after that, when the players were chitchatting with each other, Yuzvendra Chahal was seen running behind MS Dhoni and the latter evaded him to go into the dressing room to leave everyone in the splits. Chahal was actually finding a cricketer to appear on his special segment and wanted Dhoni for the same. But the wicketkeeper-batsman has never attended any interviews even funnily and tries to keep himself away from the limelight. As far as MS Dhoni’s contribution in the game is concerned, the veteran failed with the bat. He got a peach of a delivery from Trent Boult and was a part of the top-order collapse to leave India reeling at 18/4. However, Dhoni was at his best behind the stumps. His smartness bluffed James Neesham who was looking dangerous to take the game away from the team.